Being an author is a somewhat mysterious and solitary trade, regardless of how one ultimately publishes their books. When you’re self-published, however, there’s a whole other level of mystery that gets stirred into the mix, questions and opinions about why you published the way you did and what it all means in the big picture of how your value, your book’s value, is perceived. Those outside the industry, however, the readers, generally keep their focus on the books: the stories, the covers, the draw of the narrative; the reviews, the word-of-mouth, etc. What they generally don’t think about? How or in what manner an author got their book published. Which is good. It shouldn’t matter. All anyone should give a hoot about is whether or not a book has been well-written, well-produced, grabs their interest, and, ultimately, delivers the goods. Still, stigmas persist, so when you do find reviews on Amazon from total strangers expressing delight with your work, when a heretofore unknown blogger announces your book is one of the best he’s read in 2014; when a publicist plucks your work out of the ethers to declare it a “top read of the year,” you are all the more touched. Because you take none of it for granted. And when a venerable book club that’s been around for over fifteen years chooses your book to be their March read, gathering to enthusiastically discuss that book with wit and intelligence… well, for this self-pubbed author who’s been through every kind of artistic gauntlet over a long and largely independent career, that’s GOLDEN. And not to be taken for granted. Frankly, I wasn’t sure what to expect when my college pal, Eileen Butler (part of the group), sent a note informing me of the March selection of AFTER THE SUCKER PUNCH by the Valencia Hills Book Club, extending an invitation to attend the “discussion” gathering at her home mid-month. I wondered if a tight-knit group of women from Valencia, CA, might find my somewhat rough-edged tale a bit off-putting and unrelatable. I wondered if they’d find me a bit off-putting and unrelatable (I am not getting out that much! 🙂 ); I wondered if… hell, I had absolutely NO idea what to expect, but either way, I was honored and certainly up for it. 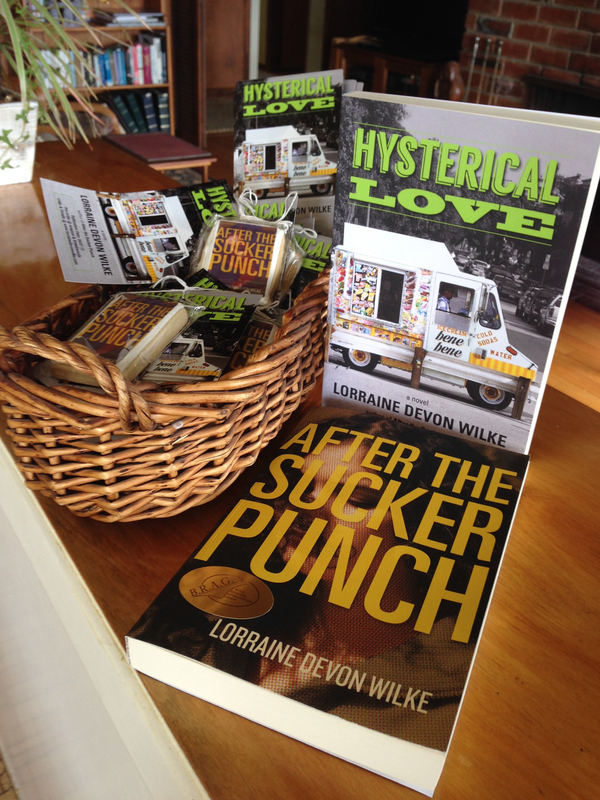 I ordered some of my Chicago cousin’s famous book cookies, printed up some “coming soon” cards for my next book, Hysterical Love, and circled the date. And when I met the Ladies of the Valencia Hills Book Club—Linda Skvarna, Sandra D’souza Benjamin, Shelly Paolucci Coleman, Kimberly Briggs Reed, Patti Paglia, Alice Sain and Suzanne Rioux —I was more than delighted to make the acquaintance of a group of smart, funny, progressive, really interesting, and really interested women. To hear them discuss the book’s characters by name, debate covered issues of cults and religion, talk about the epilogue song, look to me for answers about my thinking on certain plot elements and story twists was like being surrounded by people talking about and discussing the finer points of my child…what “parent” wouldn’t love that? I thoroughly enjoyed getting to know a bit about each of them: their fascinating stories and backgrounds, the kinds of books they’ve read over the years, and certainly about their late founder, a woman whom they speak of with deep respect. We shared good food (thank you, Eileen! ), great conversation, and tremendous mutual interest. I walked away from the evening imbued with a sense of having been honored. 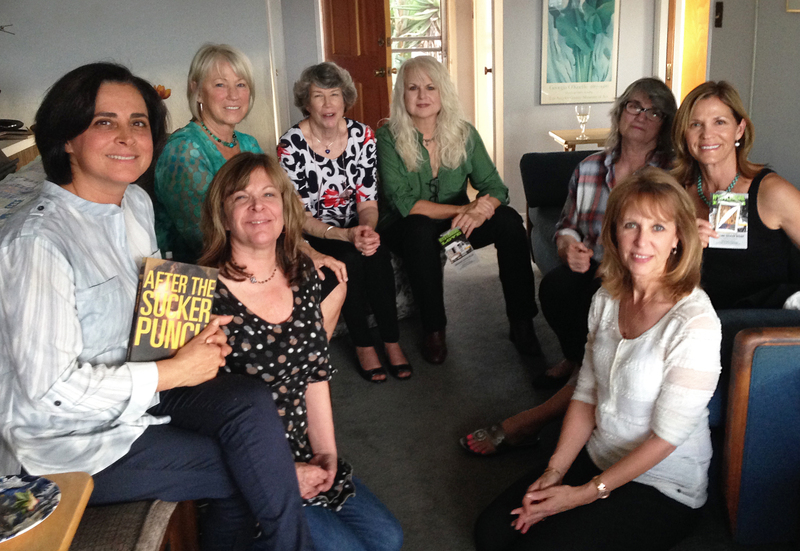 To have such an eclectic group of remarkable women give their reading time and attention to me and my book is no small thing. Certainly not something I take for granted. And regardless of how or in what manner I might choose to publish any of my books in years to come, I hope I always feel that way. Thank you, Ladies of the Valencia Hills Book Club; you truly made my day! 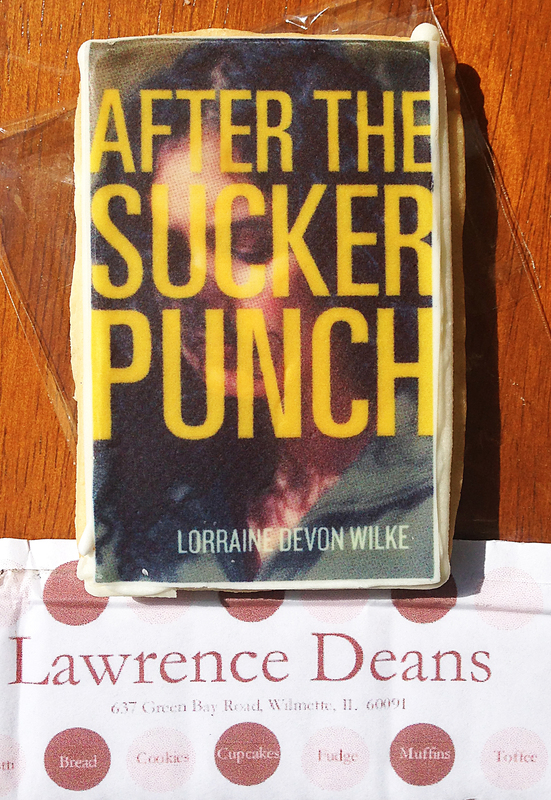 Thank you Lorraine for sharing your time and discussion about your book, After the Sucker Punch. I know all of us throughly enjoyed your book and insight of how your book came together. I will look forward to reading your new book. Wishing you much success.